Learn paper piecing in a way to save a LOT of fabric with minimal waste, as well as traditional piecing and applique, and couching threads. 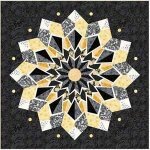 Bring your unfinished Judy Niemeyer pattern quilts and get help and encouragement! Join us for an evening of hand stitching, bring a dish to share. Use your BERNINA decorative stitches to make a beautiful Stitcher's Garden.